I’m Matthew Hunt [of Bolter and Chainsword], I don’t know if you remember me from back in 2006. I saw your review of our army carry case on youtube and noticed you were looking for information about the bags. As we are preparing for our 2009 order I thought I would pass on the particulars to you. We have 2 types, the Mk.I and the Mk. II they do not include foam. They are however designed to carry Sabol foam trays. That said, we stand by the fact that our bags are a level of quality over and above any Sabol case, as I’m sure you noticed during your review. So as you can see ours holds about an inch more foam than theirs but is otherwise similar dimensions. Holds 20 inches of our figure foam trays. Our Mk.1 isn’t as tall because all the non-foam storage is on the sides rather than the bottom of the case, but in terms of foam it holds the same amount. Yes the B&C bag is expensive but worth the cost in the long term. The bags are constructed of high quality cordura http://www.cordura.com/ by hand. By that I mean, an indivdual at a sewing machine and not some rapid production line stuff. Because they are made from cordura they are high resitant to the wear and tear a gamer would subject them to and even include a limited life time warranty. In addition to the feature of a large book pocket, the side “blister pack” pocket and the pen/tapemeasure holder the bag has a removable/adjustable shoulder strap, hand grips that can be velcroed together for easy carrying and interior foam padding sewn into the walls of the bag. The issue gets to be if you want a logo on it or not. You could see the price go up substantially then depending on if you want embroidery or screen printing. Last year (2008) the B&C Mk. II bag went for $120 with shipping and logo included. This year due to an increase in material costs we are looking at about $135-140 for the bag, still waiting on an estimate from the folks who assemble our bags. They are known as Initial Attack and they make gear/webbing for the US Military and Forest Service. If you have any interest in joining in on this years order please let me know and I can give you some more specifics in the event you want a logo on the bag(s). 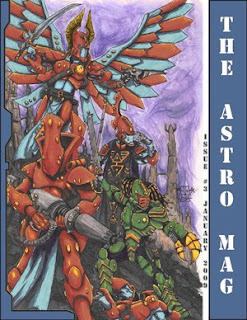 This gave me some inspiration for an Eldar army color scheme. Rich red with orange jewels; Dark Grey and White for accent colors. Sort of like Saim Hann variation on a theme. 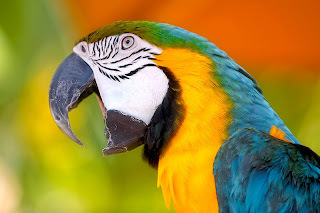 Polly Want a Talking Point- Updated! Now with five educational comments! Here are the talking points from Campaign for Liberty. I present them here for your consideration. Do they have merit? Is it true? I am only including the ones from the Economy section. Many of these echo my own sentiments. I’ve got some responses to my various political ideas that show I think a basic misunderstanding of my thrust. I am against Tyranny, whatever form it may take (government agencies, corporations, individuals). I do not like coercion. I am suspicious of anything that says “I’m good and necessary, but you have no choice in the matter”. I am a disgruntled Republican. I have been betrayed. We gave Isildur the ring, but he wouldn’t cast it into the volcano. I am not against Obama. I think he’s an improvement. I have growing respect for him. I am against the growth of government power. Right now, I am in “information gathering” mode. I am mostly interested in finding out what the Constitution is all about, learning a LOT more. And I also want to know what taxes are levied on the common man, and how they are variously and indirectly extracted. These two are related. I am entitled to my life as a god-given right. If I spend half my time working for the GOV then half my life has been taken away. Also, I welcome comments. Relevant, insightful, kind-worded comments. Even if they are completely different viewpoints. I disabled the auto-comment function after a few threatening, creepy, and off-topic items I just bagged the whole thing. * The congressional pay raise scheduled to automatically take place in 2010 should not be allowed to go through. They should have to cut back and sacrifice just like their constituents. * During these tough economic times, stopping the pay raise would show that Washington is serious about fiscal responsibility. * At the very least, a vote should be taken instead of allowing the raise to automatically happen. The Obama administration should welcome this move to increase transparency and accountability. * After decades of deficit spending and unconstitutional entitlement programs, each American’s individual share of the federal government’s liabilities is now $184,000… and rising. The current budget deficit is more than at any other time in history. This happened under a so-called conservative president/congress. We have to find our way again. * Economic freedom is based on a simple rule: everyone has the right to his or her life and property. * In the United States, many citizens seek to use the government to enrich themselves at their neighbors’ expense. This is immoral. We should stop using the government to do things that would be considered morally outrageous if done by a private individual. It is a shame that a Republican administration that was backed by conservatives presided over one of the biggest thefts in history: the bailout of the banks and automotive industry. We have to find our way back to fiscal sanity before we can dream of winning an election. * Why would we expect a system based on legal theft, as ours is, to be a net benefit to the poor or middle class? Every one of the special benefits that have been enacted by both Republicans and Democrats makes companies less efficient and competitive, and the economy more sluggish. This is exactly what will happen with Bush’s bailouts and Obama’s social spending. * There should be no income tax, national sales tax, or any other such scheme on the federal level. The US income tax implies that government owns you and graciously allows you to keep whatever percentage of the fruits of your labor it chooses. This is incompatible with the principles of a free society. * Conservatives criticized Obama for having a lavishly expensive inauguration amidst a time of economic hardship for America. But these millions of dollars are nothing compared to the billions and trillions squandered by both parties in the last decade. It seems like targeting the inauguration is an easy way for people to sound fiscally conservative while ignoring what’s really bankrupting the taxpayer: too much government spending and debt. * Elected Republicans are sounding more financially prudent every day, now that they have lost Congress and the presidency. But let us remember how spendthrift they were in power. For talk about fiscal restraint to be anything more than a way to score partisan points, we as a people need to rethink the role of government on a fundamental level. * Obama claims the issue is not big government vs. small government, but making government work. Well, elected Republicans have surely abandoned any role as the party of small government, so, tragically, he might have a point. Obama also says programs that don’t work will be eliminated. I’ll believe it when I see it: almost never does anyone from either party eliminate a government program. * Young voters, independents, and Democrats were drawn to those Republicans in 2008 who ran on a platform of limited, constitutional government. Many who voted for them were first-time voters. * If the Republicans want any future, they need to abandon their current policies of big government, high spending, corporate welfare, perpetual war, and imposing their values through the federal government. They cannot be a credible alternative to the Democrats if all they propose is to run the country essentially the same but with slight changes in emphasis. * Republicans/conservatives have lost all credibility with their rhetoric about limiting the size of government. This was once the party of Robert Taft, Barry Goldwater, and Ronald Reagan, but now it more closely resembles progressives like Woodrow Wilson. We need to get back to our roots! * There is a way for Republicans and conservatives to breathe new life into the party. The conservative movement must embrace the ideas of Austrian Economics, Ron Paul, and the Campaign for Liberty. My good friend Eric Danley already sent me this counterpoint email. Enjoy! Regardless of where they came from, these talking points are just that shallow empty shells of easy to digest propaganda. Congressional Pay Raises: Yes, they probably shouldn’t go through. But lets be honest, this will do nothing to change the economic situation. Deficit: Yep, this is bad. But let me also point out that it was under a Democratic that we had a surplus, and balanced cuts/spending increased to maintain that balance. However, let me ask how the government is supposed to pay down said debt without the power to tax? I certainly don’t have $184,000 to give away, and those without jobs have even less. What revenue is left with the Income Tax, sales tax, or other taxing schemes are eliminated? Also where would that leave things such as national defense? Cutting Government Programs: Defense Secretary Gates recently testified to congress about military research projects that should be cut. Lets remember, Congress spends the money, not the President. Republicans: Politically, they’re screwed and they still don’t get it. They will get a further lashing at the polls in 2010 with either a new Party taking their place as #2 or a huge platform restructuring bring them back to relative parity in 2012. Right now voters see them as the hypocrites they are, and voting against the Stimulus isn’t going to help. This government needs real change, and that means more fiscal responsibility. We cannot however simply push for the elimination of something like the income tax or the Federal Reserve. It will never happen. Instead, work with the Democratic Party that has overwhelming control to make sure your conservative voices are heard. The stimulus has compromises (I never would have cut the Family Planning support) but the House Republicans instead chose to vote no against compromise simply ensuring their diminished roll the next time around. You have to work with the system to change the system. First the disclaimer. I am not a Democrat, I am not a Republican. I supported Ron Paul in the primary. I voted for Chuck Baldwin in the election. I love Liberty and the principles upon which our country was founded. There is an often quoted saying in the business world, ‘Time is Money’. I think that many people subscribe to this point of view. Another saying might be “Time is Life”. This seems to be pretty accurate, at least to me. If our mortal Life here on Earth isn’t a series of interconnected moments, representing Time, then what is it? Since both these expressions carry a common variable, Time, we can infer the corollary “Money is Life”. Again, this is a point I think many or most will agree with. Put another way, the time it took a person to earn some amount of money is in fact a portion of that individual’s Life. A piece of their Life that they can never get back, never relive or trade in. Put this way, I am not sure how anyone can effectively argue the point. An expansion of this would be that because Money and Life are interchangeable it can never be moral to forcibly take one person’s time and give it to another. That would of course be slavery. While I would think that everyone would agree that slavery is immoral, surprisingly the same cannot be said where taxes and the redistribution of wealth are concerned. Why should someone making more money be forced to pay a higher percentage of their income than someone who earned less? The answer from the Collectivist camp is “because they can afford to pay more”. When asked about a flat tax system, the Collectivist answer supported the same hypocritical viewpoint. “What is the difference between Taxpayer A making $200,000 a year and Taxpayer B making $25,000 a year if they are both paying 10% in taxes?” The Collectivist camp couches their answer by talking about survival and how it is not moral to tax someone an amount that would jeopardize their survival, which they assume is the case if the person is making ‘only’ $25,000. The same hypocrisy is evident in the recent decision by Obama during his first week in office to provide Federal funds to finance abortions. Whichever side of the Pro-Life, Pro-Choice fence you happen to be on, we all recognize that this is a highly charged issue with strongly held beliefs on either side. By releasing funds to either side, the government is effectively forcibly taking money from individuals in order to grant it to groups which run counter to the moral compass of those who earned the money. Coming full circle, Obama’s (unconstitutional) executive order is therefore in fact forced servitude. Forcing those diametrically opposed to abortion to spend part of their time working to fund abortions. The reverse is also true, hence it is immoral (not to mention Unconstitutional) for the government to force anyone via unapportioned taxes. – I own me. I own my output. I have an unalienable right to defend myself, by whatever means necessary, against predators and looters. Before I offer my responses I offer you a little about myself. Understanding others is from what I have gathered a good start in terms of understanding their response and/or attitude towards a situation. I am a 22 year old Alaskan male. I on average work 50 – 70 hours a week trying to make ends meet. My fiance and I live together in our apartment in Anchorage. She is unable to work due to health problems and much to her dismay accounts for the reason the only furniture we have is a desk and a bed. We would be married already if we only had the money to fund the event. We more or less live pay check to pay check hoping she gets better so that we may pay off her medical bills and buy a house. Living in Alaska is not cheap and If I could find a job with similar pay and benefits else where we would probably move until we could get ahead. Something for consideration in terms of our local economy: the cost of heating homes has recently seen a 20% increase. Gasoline is not cheap here despite the fact we have tons of oil. At the moment gasoline is about $2.40 a gallon. Before I start my initial request from before is I would like to post a link to your site from my blog and wanted to verify that this is okay. 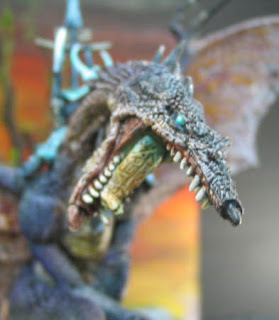 Additionaly the recnent tyranid conversions video was amazing. I would really like to know if it would be possible to get a ripper diorama of the land mine recreated. Side not please forgive my spelling apparently spell check is no longer available for english according to outlook… a tecnical difficulty I will resolve later. I can be found at www.uzbad.com. While I see the merit of a free trade economy I believe there should be some form of an organization tasked with ensuring that unfair practices such as dumping do not become common place. This is a classic example of the double edged sword. The financial institutions casued this problem but without them we would be in a very bad place. They loaned money to people that could not afford to pay them back all in the hopes of getting rich. They loaned money that they did not have and was not theirs and now we pay the price in the form of a collapsed housing market and well… we pay the price literally to. I did not want to give them my money that I worked hard for. It was something that had to be done but should have been done differently. There are other options then my tax dollars. The Oil futures trading bubble that robbed americans of their money and went against all rational economic trends. Another example of how the big financial institutions robbed us. Investments firms buying all the oil just so they can sell it again for more money when they hve no place in the trade market for oil. You can thank Enron for that one as they are the ones that pushed for the markets to be unregulated. I work for a telecommunications company and there are some foul companies out there. I like to think mine is deffinately not one and I am honest with my customers and avoid the lies and hype you get from most. The processes that have to be done though to switch from one telephone provider to another still boggle my mind thanks to the good old FCC. I sure would miss the road maintence crews and the like but there is definately some less then happy taxes I pay. Why my tax dollars pay for someone elses food while my wife and I eat at most 2 meal a day of chicken and rice because that is all we can afford is a concept far beyond my understanding. It is a ploy as you have pointed out. I agree with them saying yes save the money tey spent to listen to him fumble his swearing in. You are right though this is no an approach we should just be taking. This is not something that just happens. I say gimme an hour and a large vaccum and lets do something useful with the money hole. I will agee they are just saying what people want to hear. At the same time these are not all the same republicans that were in office during the bush era. Many long term senators have gotten the boot and are making way for what I hope will be a better congress. I would love to see this actually happen. I would love to go to mars as well. A few things in relation to your most recent blog post. (As always these are just my opinions). When people say that “we had a surplus under Clinton” I’m not sure everyone is saying the same thing. What most people assume from that statement is that the government was making a profit, taking in more money than it was spending. Strictly speaking, that wasn’t really the case. The surplus was predicted and even then, proposals and budgets were presented that would spend that money, even before it was collected. Second, it’s very important here to distinguish between a budget deficit and the national deficit. Clinton left office with a national deficit (the amount of money that the country owed to its creditors) of several trillion dollars. So in a very real sense, just because we were able to not spend more money than we were making, we never had a true surplus, a pile of money free and clear of obligations. While I’m very much in agreement with what’s being said about republicans needing to return to a platform of true conservatism (smaller government) and the fact that a huge restructuring is in order, it’s worth noting that many people voted in the last election not for Obama, but against Bush. I never understood this since no matter who was elected, Bush was going to leave office, but that’s beside the point. Democrats have had a majority in congress for a few years now, the most recent elections simply allowed them to firm that into a dominant position rather than a competitive edge as it were. While presidents take the flack for what happens during their terms, it is usually congress and the senate that effect change. The president cannot create laws or set the national budget. He can only veto what comes across his desk, unless he is over ruled by a vote of (you guessed it) our elected representatives. While I take no joy in looking back on Bush’s presidency, it is unfair to blame him for the current state of the economy. Oversight committees in the senate and congress, offices like that held by Allen Greenspan, individual banks who dug their heads into the sand, and citizens who deluded themselves into believing that because the bank wasn’t asking them to prove that they could afford something meant that they could actually afford it, share much more of the blame here than any one presidency. Unfortunately, the government is going to spend money. Just getting a balanced budget submitted and prohibiting the printing of new money would seem to be a herculean task, one that neither party seems to want to pursue. Right now I’d just settle for our dollars being spent on actual projects (like the rebuilding of our national power grid.) At least then if we’re going to drive up the national deficit the government would be affecting some real good, rather than just buying out the bad lone that got us into this problem in the first place. Like one of your other writers, I’m not against taxation (particularly income taxation) per-say. The government provides many services which I benefit from in one way or another. What I object to is the way Americans are taxed over-and-over again for the same things. I make money, I pay taxes on it. I spend that money; part of that money is taxed as well. I invest the money I paid taxes on and make a profit, hey, that profit is taxed too. Let’s not forget that the money I spend on goods and services (money that is taxed through sales tax and income tax before it even gets into the hands of a business owner) is taxed yet again in the form of licenses, corporate taxes, social security taxes on the portion of that money that goes to employees, and any number of other taxable items. Consider this, If I pay 30% income tax between state and federal, and 6% sales tax here in Maryland, I have effectively just paid the government somewhere on the order of 35% of my income, even before I realize any sort of return on that money. How can I, one citizen, break the vicious cycle of deficit spending and boom-bust economics which our government has tied us too? Who can I call? What can I do personally? If someone can explain this to me, in terms that make sense, I would be ever so grateful. That is, right now, my biggest issue. Everyone wants to talk about how bale out bad! Economy Bad! Bush Bad! Rush Limbaugh Bad! Democrat Bad! Auto Industry Bad! Taxes Bad! Surprisingly the answer everyone has to solving this problem.vote democrat/republican. That is precisely what got us into this situation in the first place. Obama has huge public support. If he can turn that into real, honest, fundamental change (something more than a good publicity campaign masking business as usual) then he has my full support. But the individual citizen needs to expand their influence on government to more than which choice of a binary solution set they will give their vote, let alone voting in the first place. “Q. What is an Economic Stimulus Payment? “A. It is money that the federal government will send to taxpayers. “Q. Where will the government get this money? “A. From taxpayers. “Q. So the government is giving me back my own money? “A. No, they are borrowing it from China . Your children are expected to repay the Chinese. “Q. What is the purpose of this payment? “A. The plan is that you will use the money to purchase a high-definition TV set, thus stimulating the economy. Email me at bluetablepainting@gmail.com if you can produce this key info. Ice World Tau Ready for War! Total cost is $2500. Buyer to pay actual shipping. Other than this plug, I am not involved. Please contact this person directly. Last night it was raining. I went out to the pedestrian door of the garage to look out on the sulking charcoal sky and to watch the raindrops streaking through the porch lights, like minute frozen flares. My breath coiled upwards, snaking around the bulb. As I watched, the droplets became thicker, and finally into a type of snow that doesn’t stick, but forms a thick layer of slush. By morning there was a thick layer of it all over the road and the drive. By the afternoon, it had warmed enough to break it down forming rivers of clear water all around town. I took the two kids to church, Tamie staying at home with the two youngest again. I think she’s burning out on baby. She’s getting tired. What do I think? Blarg, does it matter? Well, I suppose if you’re here reading this there must be a reason. I have become more relaxed in the last year. When things go wrong, I don’t view it as going wrong per se, but an opportunity to learn something new. For me, it all comes down to a fundamental truth: there is an Almighty and Loving God, the Universe is full of light and color, and I am part of it. I often lose sight of that. I wish I were a better man, too. But slowly now. It’s only half time! It was a lazy rest-of-the-day, playing Magic with my seven-year-old-son, and watching Disney shows. 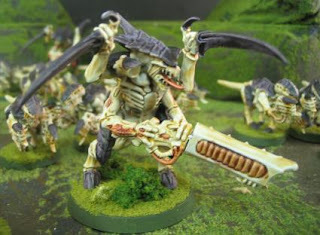 Spinegaunts, point for point, are more killy than genestealers. Anyone care to math-hammer that? 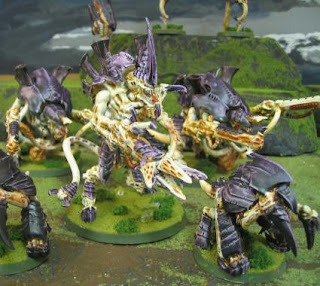 Buying more raw un-equipped tyranids is more killy than upgrading existing ones. Devourers are awesome. Lots and lots of shots. There are extra models, too: another foot Tyrant, a fourth Tyrant Guard, and a third Sniper-Fex. What could make this army better? Should I add any models? I’m at home watching the kids while my wife (and baby) are away out of town for the day visiting family. Basically, I am twiddling my thumbs. I can be contacted via email or gmail chat for any matter. I’d love to get some projects set up. I am making an order on Monday morning and I’d give 35% off the cost of your models if you set something up with me tonight. That means a deposit needs to get in by midnight tonight (seeing as I’m closed for business on Sunday), or at least by early Monday. For those that are just joining the program, you should also know that I give 20% off the cost of materials standard, and 30% off for military personnel. 4) Tank Factory—ten tanks painted for $400, assembled for $200. See below for details. Can be combined with Artistic License. For this special we need some leeway with color scheme. A complicated pattern or type might cost more. Generally, a 3-4 week turnaround. Unless you send the models, then that takes less time.  Large tanks, like a Land Raider or Necron Monolith, count as two tanks.  A Baneblade counts as three tanks. Assembly is $90—the Baneblade has something like 250 parts.  Small tanks, like an Ork warbuggy, count as half a tank.  Exposed crew, dozer blade, unusual upgrades, or set of chaos spikes count as a regular trooper, at $4 for painting, $2 for assembly.  Tau Piranhas and Land Speeders count as regular tanks. They are smaller but are not less time-consuming to paint. I am setting up projects now for completion in late February. In other news: I went to dance class with my wife this morning. This was my idea. It was wonderful, we were moving smoothly in no time at all. We had to bring the baby and had a few dances with her snuggled in between. Children are the blossom of love between a man and a woman. I am really looking forward to it next week. Flash back fourteen years. We rented a how-to-dance video. Within ten minutes I was so worked up and uptight that the topic didn’t come up for another fourteen years. So, ladies, there is hope for your man. Every month all the artists get together and we have a Paint Fest; a time to share ideas, joke around, and paint like fiends. I can’t imagine heaven is any better. This time we headed to Sarah’s house, which has a lot of natural light, and we gathered around an enormous table. But I am ahead of myself. I stayed late at the studio last night packing everything in preparation. That included an entire Tyranid army (the hive Hades army, remember?) which Sarah and I managed to refurbish quite nicely. Everything is completely in order, improved, touched up, and detailed. Sweet. But I’m jumping ahead now. On my way in I stopped at the store and picked up about six gallons of various drinks. I decided to get something healthy, so I got a banana cream pie (that has banana in it right? fruit is good for you right?). I also picked up some potato salad at the deli. The crab salad had sort of a funny smell so they gave me a tub of it for free. Just kidding. But I did get some crab salad for free (I had to wait a long time for someone to finally get back there). As many of you know, Sarah is strict vegan so we had quite a platter of fresh veggies waiting for us. And a lot of juice. But there was plenty of savory fare as well– mexican type things, and peanut butter rice krispie treats. Oh, and while down at teh local game shop I got to take a gander at the new Lizardmen army book. Absolutely stunning. I can’t wait to get going on those. This will be Sarah’s project for the most part, first run at doing an army start to finish for her. Well, probably better just to give you a look. Some of you may notice a few new painters here. I normally don’t give face time until someone has at least three months (usually more like six) under his or her belt. Not set in stone, but there it is. Also, almost everyone is part time, and we all like it that way. It’s good way to be. Everything is peaceful and tranquil. Zero drama. I dropped Joseph off at home, then headed home myself. My wife immediately headed out on an “errand” which of course means “I’m tired of the kids and I need a break”. Which I am completely groovy with. I really, really enjoy my kids. They are all so delightful. My youngest son bit his tongue. He decided the best remedy would be to put a bandaid on it. One tab on each mouth corner and the body of the bandage in his mouth. Hi-larious. Back to Hive Fleet Hades for a moment. I can’t wait to play this army. It looks amazingly good. You can look forward to pics and vid of that later. Another bit of news. I am looking at www.battlefoam.com and we’re likely to add that to our repertoire soon. 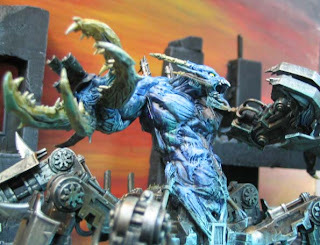 The big news today is the arrival of Hive Fleet Hades as a trade-in. It’s a studio army now. Tomorrow is paint fest and I plan on going over them minutely for touchups, refurb and improvement. I may darken the skin areas just a bit. They are done in one of my favorite color schemes. The army is solid and fun to play. It is based on proven mechanics– lots of gribblies and lots of shots. It’s loaded with twin-linked devourers. I think that’s the only thing any of the critters has. I tried to put them together with two part epoxy glue I got from a hardware store which was an absolute nightmare. I also primed the army with black enamel paint, which was hideous and ineffective beyond belief. My color scheme was bone colored carapace and bright purple skin. At least I had a decent color scheme, though I use the word “decent” liberally here. I had about 60 of those metal hormagaunts. That was a lot of gaunts for 2nd edition! I had a load of fun with them– making little scenarios pitting them against imperial guard. I even had the army through ’97 when I had my game shop. A footnote here about Politics. I am taking a short sabbatical. I need to read more. I need to get the basics of the Consitution down. In other business-related news, I will be clearing out my Inbox on Saturday. I apologize for any delay in getting back to clients for various matters. There are only a few in there, but I just ran out of steam. And tomorrow is Paint Fest! I am currently booking project for February, mid-to-late-month for completion.